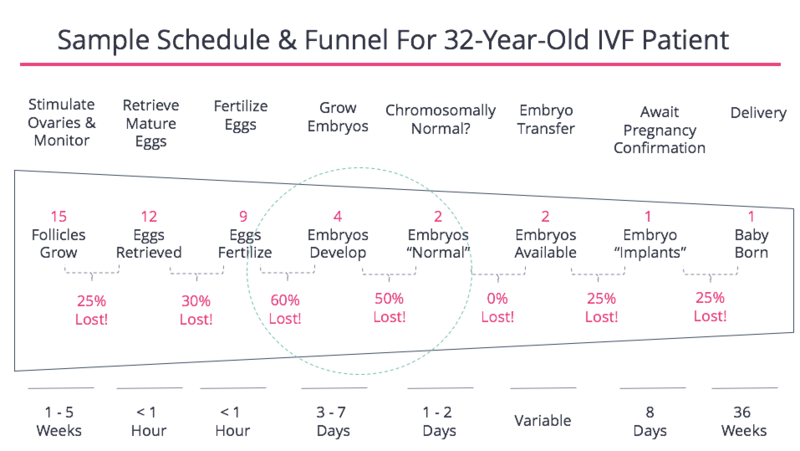 As we show in the example below, during every step of IVF a certain number of eggs or embryos are lost, especially in the middle part of the funnel (growing embryos that are chromosomally normal). As a result, a woman needs to start the process with many eggs. Ideally, between 15 - 20 mature eggs would be retrieved, though getting a number that high is uncommon. 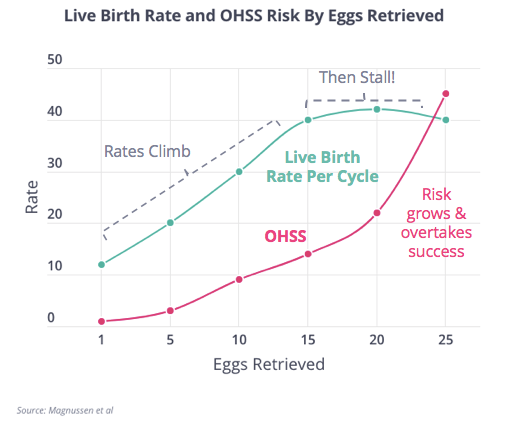 As you can see below, the odds of success (green line) continue to rise as more eggs are retrieved, until about 15 - 20 eggs, at which point the odds of success stop climbing and the risk of developing ovarian hyperstimulation syndrome, or OHSS, (pink line) skyrockets. OHSS can be excruciatingly painful and, in some cases, dangerous. This comes from a 38,000 patient European registry. As a result, most fertility doctors shoot to retrieve 15 to 20 mature eggs per cycle. Of course, during a regular cycle most women naturally produce only a single mature egg. To bridge that gap, doctors prescribe drugs that woman take at the start of a cycle to instigate growth of ovarian follicles that contain eggs. This is called “multi-follicular” development and it’s a pivotal step in a successful IVF. The combination of drugs and their dosing is known as a “protocol” and while it may seem like there are a dizzying number of protocols, the reality is there are only a few core options. By and large there are two easy ways to think about protocols: how much gonadotropin (the drug that prompts follicles to grow) gets used, and what other drugs get used alongside the gonadotropin which is typically what defines a given protocol strategy. 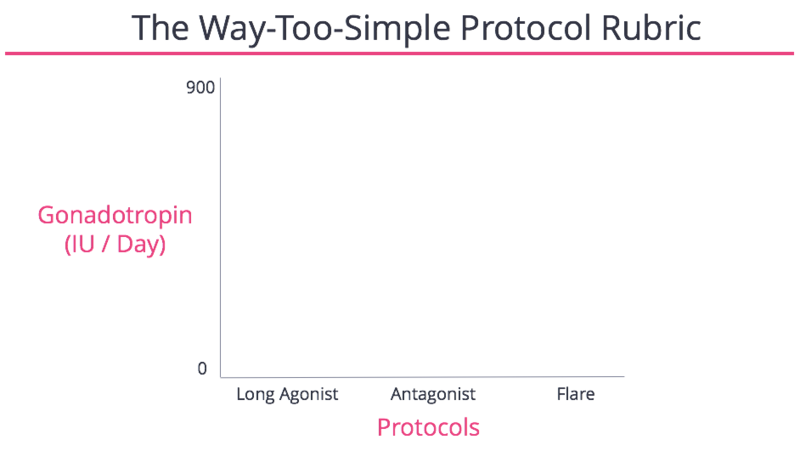 There are 2 - 3 core protocols: the Long Agonist, Antagonist and Flare. Below is an oversimplified way to visualize this. Let’s start with how much gonadotropin to take. Again, gonadotropin is the injectable hormone that prompts a higher number of follicles, and thus eggs, to grow at any one time. 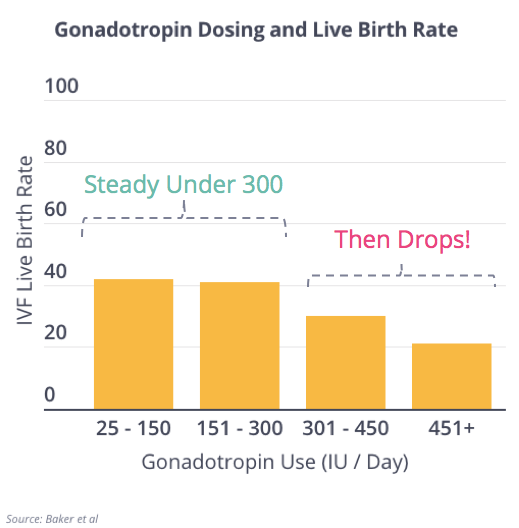 The dose of gonadotropin is typically measured in “International Units Per Day” and ranges from 0 - 900 with most IVF patients receiving 250 - 450 IUs per day. 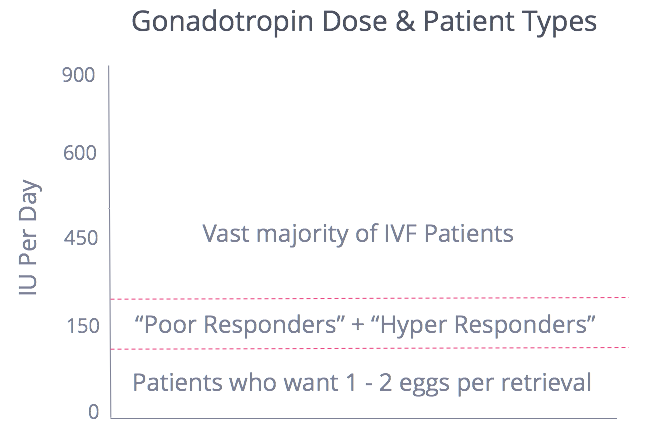 The dose of gonadotropin matters because, generally speaking, if too little is prescribed, too few eggs are retrieved, and IVF success rates go down. On the other hand, if too much gonadotropin is taken, a woman is at higher risk of hyperstimulation, known as Ovarian Hyperstimulation Syndrome or OHSS. Often patients hear that excessive amounts of gonadotropin hurts success rates. That data comes from an analysis of over 700,000 IVF cycles run by well-respected investigators at Stanford. 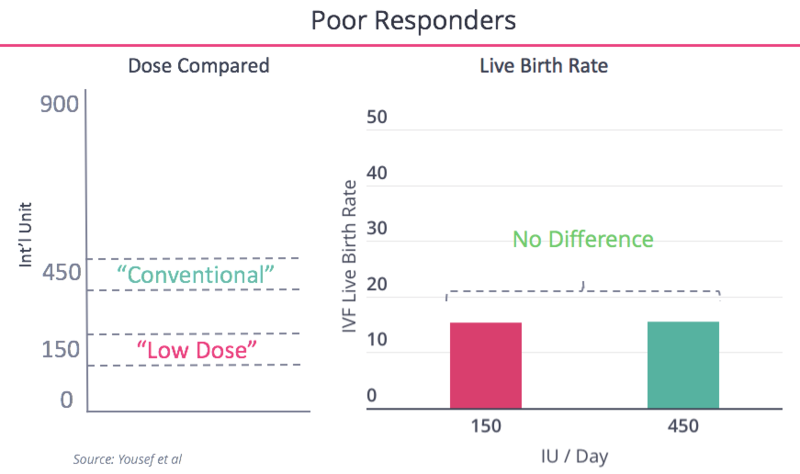 The results are below and as you can see, success rates do seem to drop off after 300 IUs per day of gonadotropin. However, the study has two major shortcomings and for that reason most experts aren’t ready to concede that rates of gonadotropin over 300 IUs per day is harmful. First, the analysis was retrospective and not prospective. As a result, it’s hard to correct for confounders like the fact that harder cases may (or in our minds, probably) had been given more drug and so the underlying condition, rather than the dose taken, contributed to the lower rates of success. Second, this study was only done in cycles using a “fresh” transfer. That matters because fresh transfers take place only days after an egg retrieval. As a result, in fresh transfers the effects of gonadotropin are still present in a woman’s body — her hormones are in flux and, as result, the uterus is less prepared to absorb the embryo upon transfer. 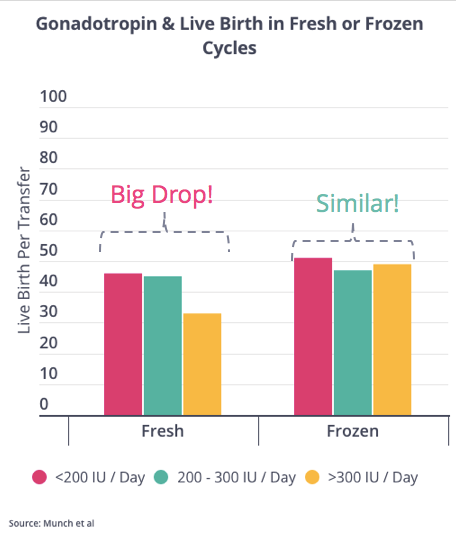 Today, most IVF cycles use a “frozen” transfer whereby embryos are frozen and transferred at least a month after the retrieval. In that time a woman’s hormonal balance has been restored and so IVF cycles using a frozen transfer are more likely to work. Thus, the negative impact of taking a lot of gonadotropin may be minimized in a frozen transfer. Take a look at the data below published on roughly 1,000 fresh transfers and 1,000 frozen transfers. In the case of the fresh transfers, you can clearly see a similar effect to what investigators found above: success rates drop with more drug. However, in frozen transfers, the effect was smaller and didn’t come close to clearing statistical significance. A fundamental question is whether protocols using a lower dose of gonadotropins do as well as those using a higher dose of gonadotropins. 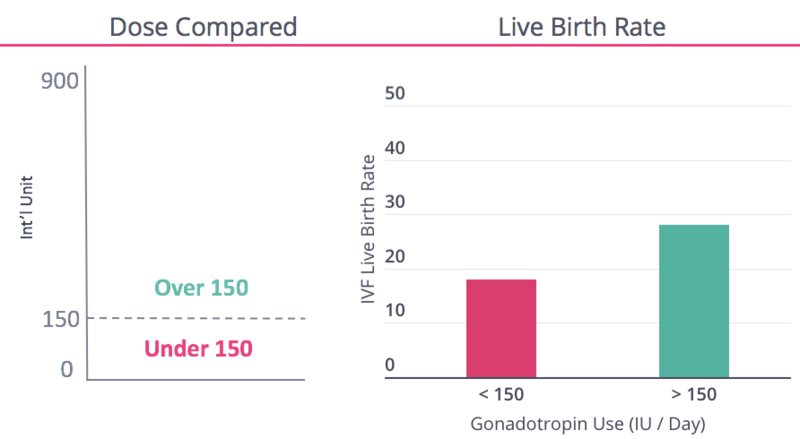 One well regarded study determined that amongst most IVF patients, those taking over 150 IUs per day of gonadotropin had higher rates of success than those who took less. Another set of investigators looked at a variation of the same question. They studied what happens when you replace gonadotropin with clomid (a cheaper, less potent alternative) for a few days before the retrieval. As you can see below, success rates dropped. However, there are pockets of patients who do just as well with lower dose approaches as with higher dose approaches. 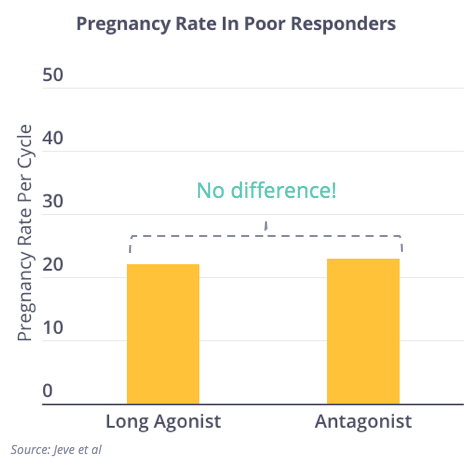 Specifically, “poor responders” (a less than pleasant way of referring to women who produce few eggs per retrieval), do equally well taking 150 IUs of gonadotropin as 450 IUs. 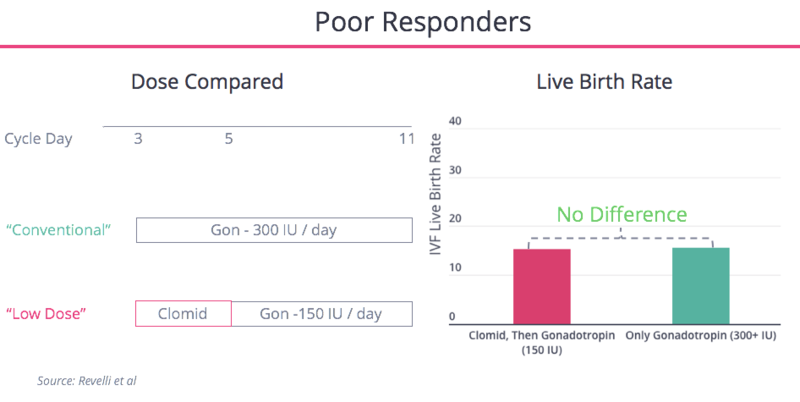 Typically, a poor responder is someone who meets two of three criteria: they have collected three or fewer eggs on a previous cycle, is over age 40, or who has a diminished ovarian reserve (antral follicle count below 5 or an AMH below below 0.5). Below you can see that when investigators gave poor responders 450 IUs or 150 IUs per day, the groups had nearly identical success rates. 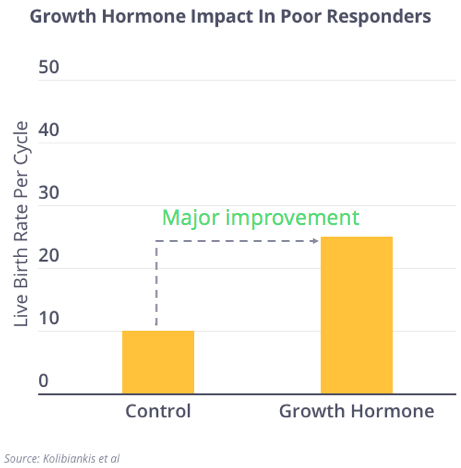 Most experts believe these women just don’t seem to respond to increased doses and so above a pretty low threshold of gonadotropin, success rates don’t seem to budge much. Similarly, when an investigator named Revelli decided to swap out a few days of gonadotropin for clomid in this poor responder population (and thereafter resumed gonadotropin at low levels), he saw similar rates of success to more conventional levels of gonadotropin use. Today, we’re seeing more well-respected doctors choosing to compliment lower dose of gonadotropin with clomid or letrozole in this group. Similarly, many doctors believe “low dose” approaches work equally well as high dose approaches on women who are likely to be “hyper responders.” These are women who have a high AMH or had a high number of eggs retrieved in a previous cycle. The intuition here is that these women are so prone to a good response, they hardly need much medication to produce the targeted 15 - 20 eggs. What’s important to stress here is that just because some “low dose” approaches drive comparable rates of success to conventional approaches, that doesn’t mean all low-or-no dose approaches are effective. As you may recall in the Revelli and Yousef studies, 150 IUs per day of gonadotropin were used, which is well higher than most things marketed as “mini-stimulation” approaches, and any “natural” (no gonadotropin) approach. While gonadotropin is the critical drug in most every protocol, it’s not the only drug. Often two other types of drugs are needed to accompany gonadotropin: those that block eggs from “maturing” and being ovulated before they and can be retrieved, and those that help trigger the eggs to mature so they can be retrieved. As you can see in our summary below, there are multiple drugs that can perform these two functions — the one that’s chosen dictates the protocol strategy. 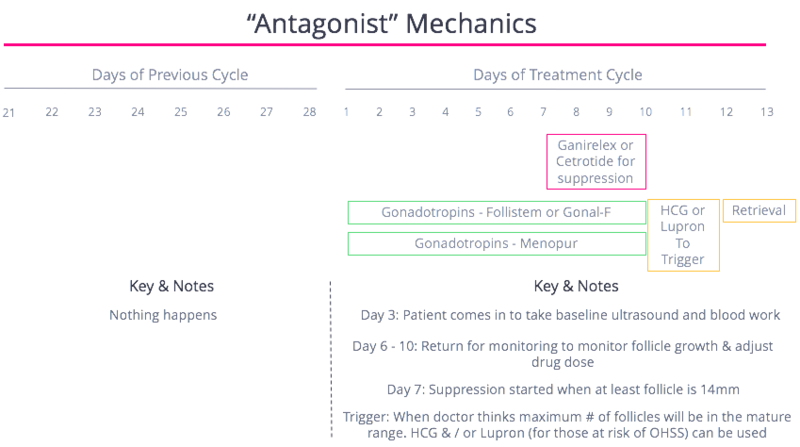 Ultimately there are two protocol strategies doctors will use: either the “Long Agonist” or “Antagonist” protocols. This amounts typically to a “Coke vs. Pepsi” kind of decision. Within both, doctors can prescribe as much gonadotropin as they’d like. 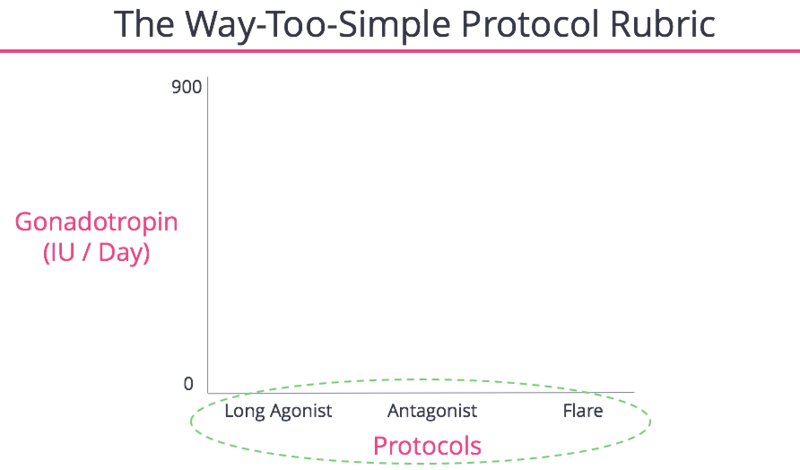 A third option, the “Flare” protocol is used less often and only in very specific patient types (often poor responders). 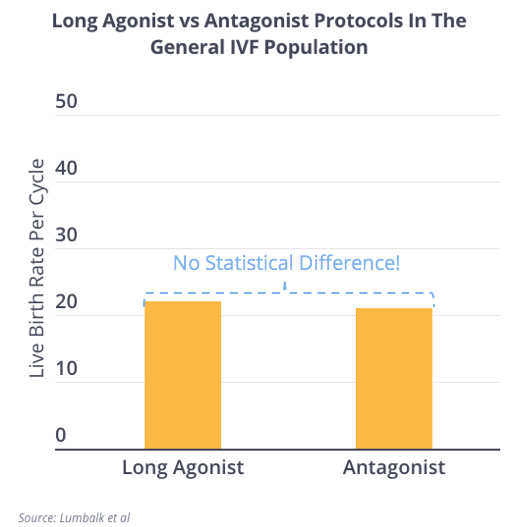 The first question is naturally, “which protocol is more likely to deliver a baby,” and when investigators looked at the two most popular strategies, “Long Agonist” and “Antagonist,” it became clear both were equally effective in the general IVF population. Below is data collected on over 3,000 cycles for each protocol approach. However, when it comes to specific IVF populations, it’s clear that certain strategies and doses are better than others. Here’s an example from the same study. 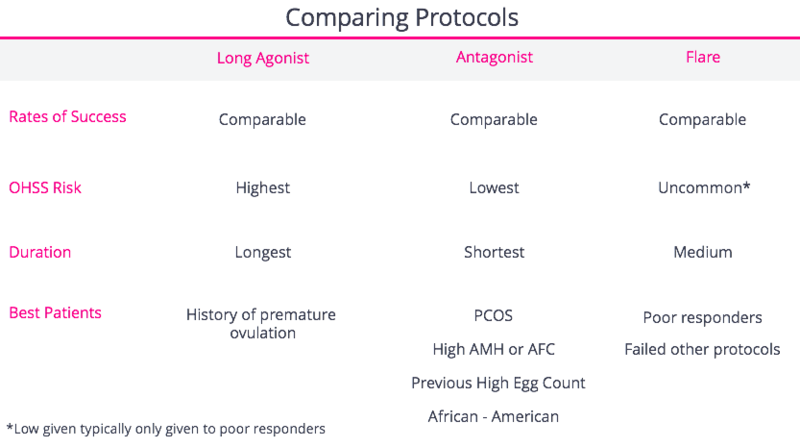 As you can see below, amongst women with PCOS, the Antagonist protocol drives comparable success rates but with far lower risk of hyperstimulation. You may wonder how that’s possible. The answer lies in the drug the protocol uses to trigger the eggs to mature so that they can be retrieved. This drug’s known as the “trigger shot”. 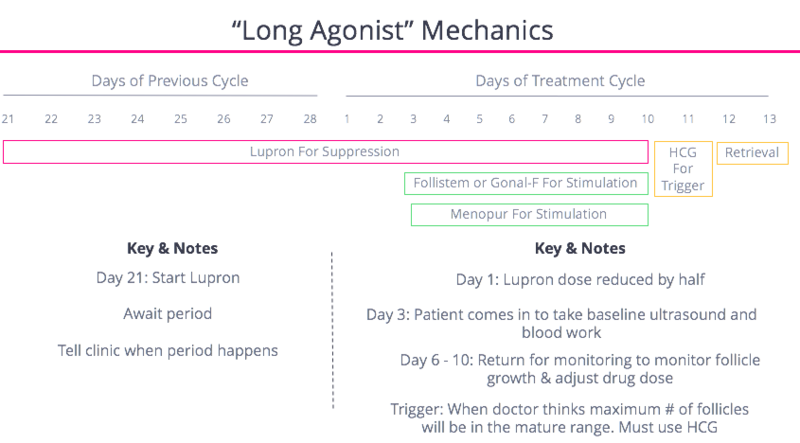 The Antagonist protocol uses Lupron as its trigger, rather than hCG, and Lupron’s properties dramatically lower the risk a woman will hyperstimulate. On the other hand, the Long Agonist protocol can’t use Lupron as the trigger because it already deploys Lupron elsewhere. 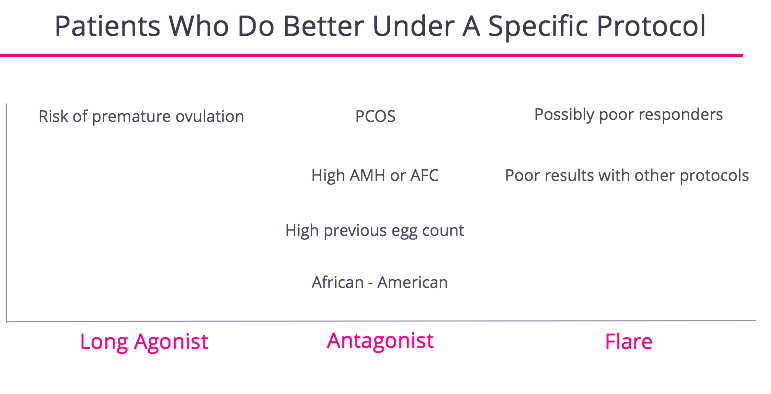 As a result, the Antagonist strategy is generally preferred for women at especially high risk of developing OHSS, namely women with PCOS, younger women, women with high AMH or AFCs, African American women, and those who produced a high number of eggs in a recent cycle. Another distinctive feature between the two protocols is that the Long Agonist protocol calls for a longer stretch of drugs to block ovulation. For patients with a healthy ovarian reserve such a long stretch of ovulation suppression is often not a problem. However, for poor responders many doctors worry such a long duration of suppression can hurt outcomes. However, the data doesn’t bare that out. Below is a meta-analysis of 17 (relatively small) studies that, taken together, show the strategies have nearly identical pregnancy rates. Ultimately, for only a handful of patient types has one protocol shown itself to be superior to the others and we profile those below. However, given some of the additional features for each protocol (for example, the duration of suppression), some patients might find one preferable to the others. In the next section we’ll walk you through the mechanics of each protocol. As we discussed there are drugs that stimulate follicles to grow, suppress the follicles ability to release their eggs, and then help catalyze the follicles to mature their eggs so they can be retrieved. These drugs help a woman grow multiple follicles, and thus multiple mature eggs. This hormone is injected by the patient and directly instigates the ovaries to grow more follicles. It’s effective, but expensive, and raises the risk of OHSS. There are two types of gonadotropin — FSH and LH — and most data shows you need both during an IVF cycle. 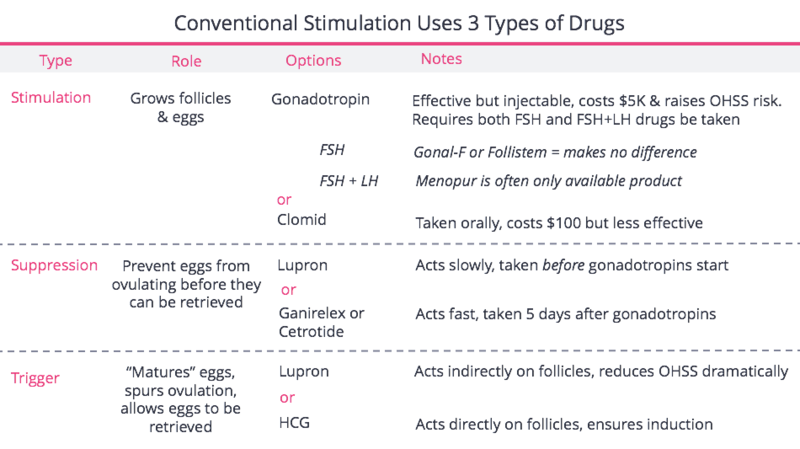 To get FSH, patients take Gonal-F or Follistim (many consider them to be interchangeable) and to get FSH-plus-LH most women take Menopur (pretty much the only product on the market). This drug works indirectly by prompting the brain to produce more gonadotropin to signal the ovaries to grow follicles -- so it's not directly stimulating the ovary. Clomid is cheap, easy to take (oral), drives less risk of OHSS, but is less effective. Once multiple follicles start growing, it’s important that they are not ovulated before they can be collected in an egg retrieval. These drugs signal to the brain not to instigate ovulation. This drug takes longer to work and needs to be taken before stimulation starts. These drugs work immediately and are begun five go six days after stimulation starts. These drugs perform the opposite duty of suppression. Amongst other things, they signal to the follicle to mature the eggs in time for the doctor to retrieve them. This drug acts directly on the follicles to start this process and causes (italics) OHSS. This drug prompts the brain to release LH, the signal for ovulation, and is effective in helping to avoid OHSS. The combination and duration of drugs to stimulate, suppress, and incite ovulation taken together comprise a protocol. As we showed you above, typically no single protocols is best for all IVF patients, though specific protocols often make sense for some patients more than others. That patients must use an hCG trigger — they cannot use Lupron as a trigger (because they’re already taking it) which is problematic because Lupron is the only “trigger shot” that fends off OHSS. Thus, for those most concerned with OHSS (like women with PCOS or high AFC or AMH), this can be an inferior option. This is the most commonly used protocol whose primary features are a shorter duration of injections and a far lower rate of OHSS, thanks to the ability to use Lupron as a trigger. For this reason, the antagonist protocol is a good option for those women most susceptible to OHSS. This protocol is used almost exclusively in women who’ve had a “poor response” in a previous cycle or who have evidence of diminished ovarian reserve (AMH less than 0.5 or an AFC less than 5). 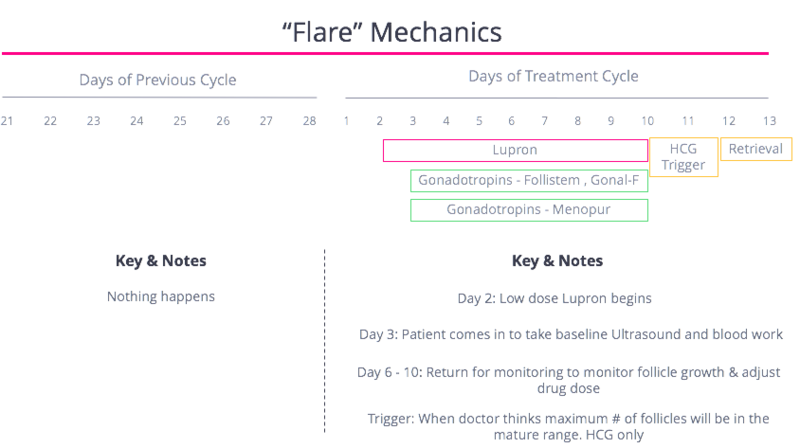 While the flare protocol does not allow for a Lupron trigger to prevent OHSS, these patients don’t have a strong reaction to the gonadotropins (hence their modest egg retrieval numbers) and are seldom at risk to be overstimulated. 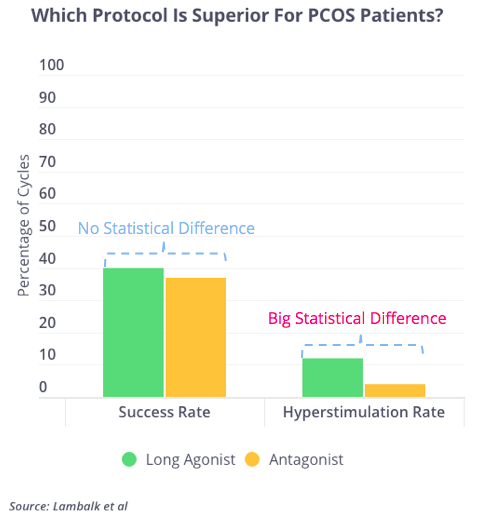 There are a number of drugs that can be tacked onto the beginning of a cycle that may increase the odds of success. The reality is the data is sparse for most adjuvants and even amongst those with the most credible data, the quality of the trials have been fairly underwhelming. Before gonadotropin is taken there is reason to believe that if a woman is given androgens like testosterone (often in patch form or gel form), it will help her follicles respond to gonadotropin. Most of the encouraging studies have been in poor responders, but because the trials were so small, most never met statistical significance. The data supporting the use of growth hormone in poor responders leading up to gonadotropin use is more convincing. An analysis that combined six extremely small studies (that in aggregate only included about 160 patients) show gains in live birth rates, as you can see below. However, we’ve yet to see a large, rigorous, prospective, randomized trial on the subject. Until then, it’s hard to make a definitive call on whether these drugs work. 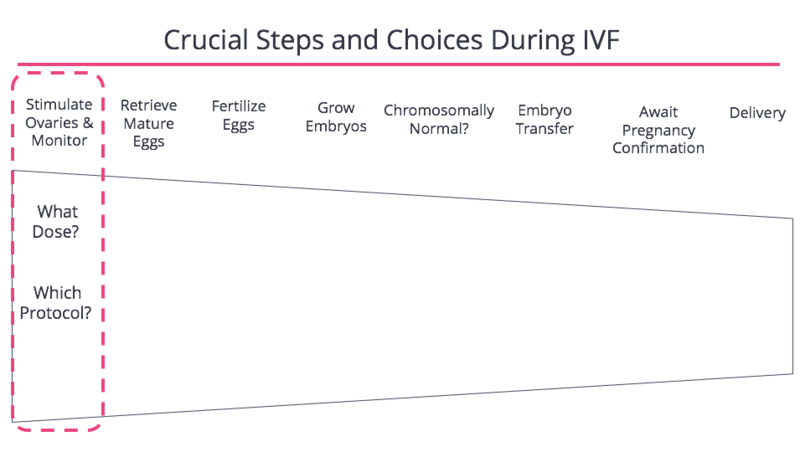 Why do IVF? Who does it help? Success Rates: How Often Does IVF Work? What Is PGS Genetic Screening? What To Do When PGS & Grading Results Conflict?